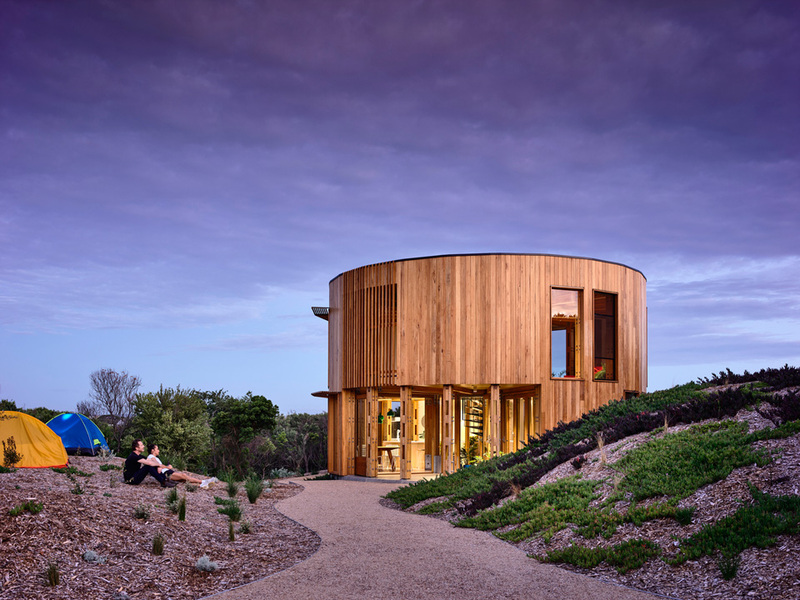 Located on Victoria’s Mornington Peninsula, St Andrews Beach has no shopping strip and no restaurants. There’s a corner store, a brewery, and not much else. 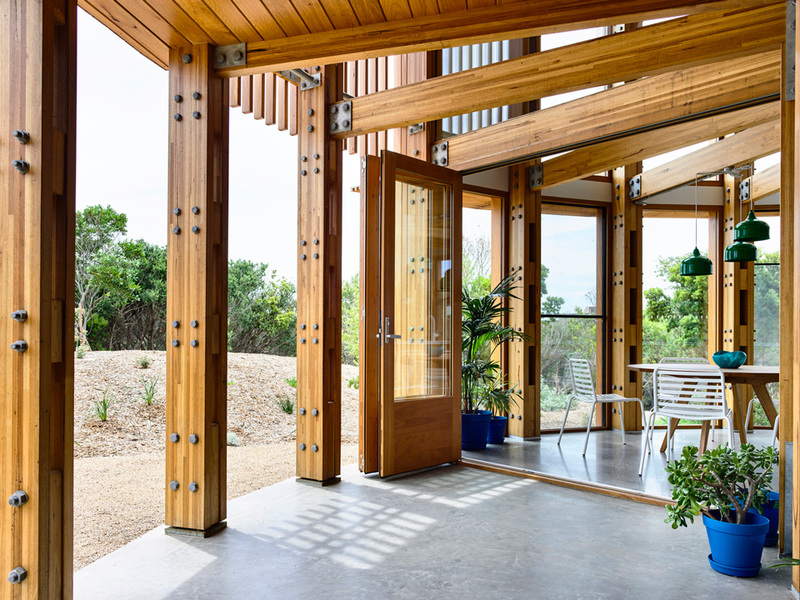 What it does offer is serenity and seclusion, a wildly beautiful coastline, and some of the most celebrated residential architecture in Australia. The owner was fortunate enough to own land abutting national parkland, close to the foreshore and directly within the sand dunes. 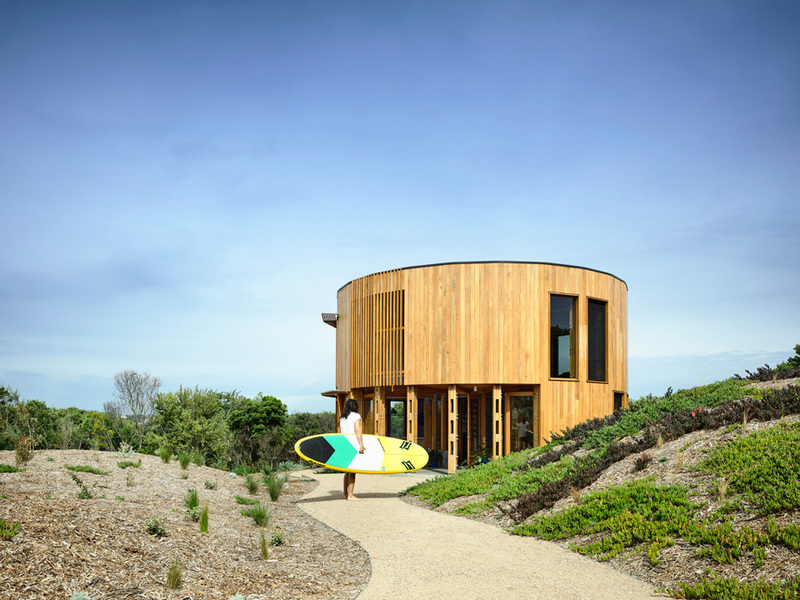 Less than five meters in radius, St Andrews Beach House is an object in the landscape. 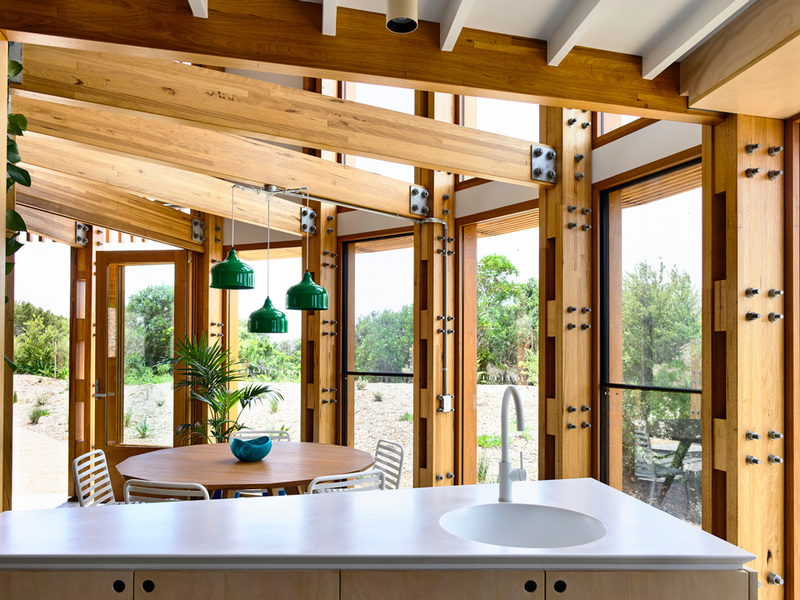 A Euclidean form set amongst the rough and sandy terrain it provides – in modest form – everything you would need and want in a beach shack. 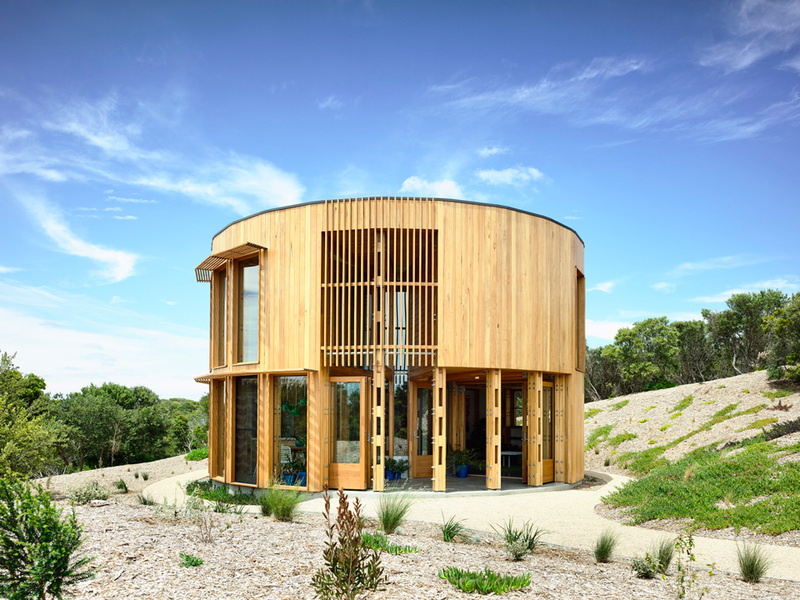 Designed by Austin Maynard Architects the house is a two-story circular holiday home that takes advantage of the remoteness of the site and expansive views, which extend in all directions. 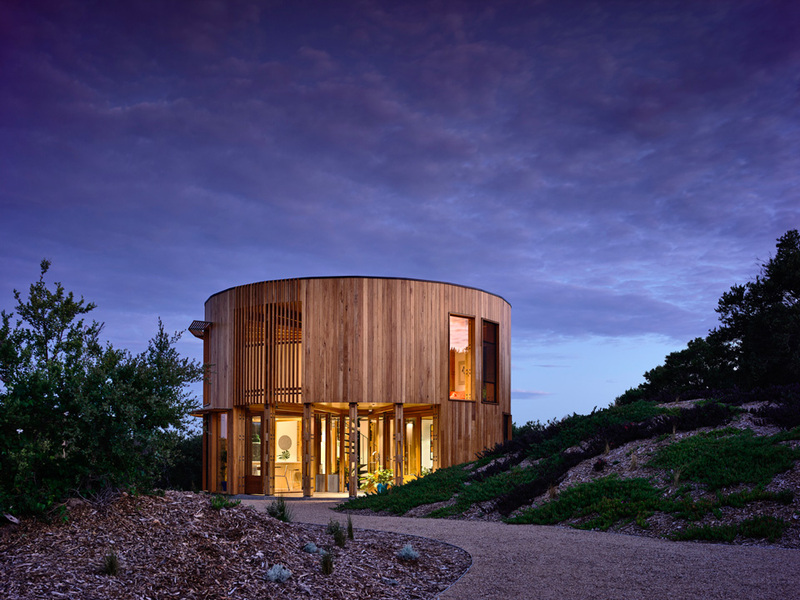 The house stands alone, in amongst wild bush, rugged sand dunes and scrub. 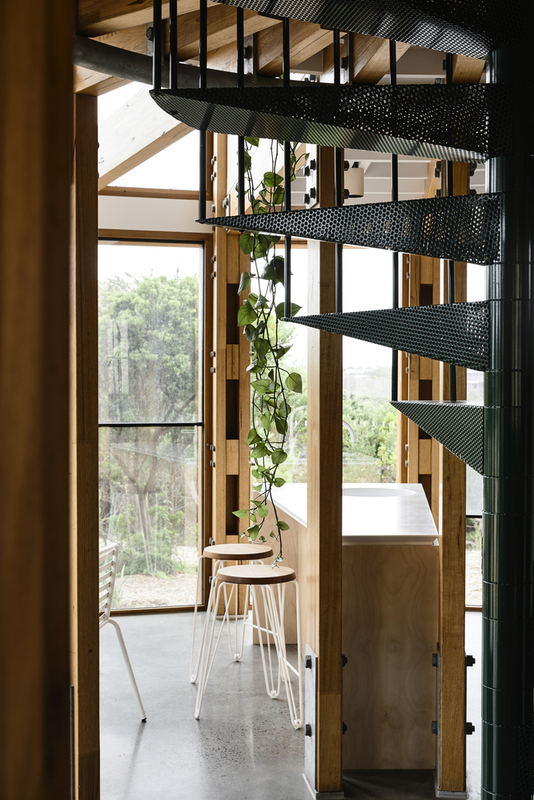 The internal spaces are generated by a tightly controlled plan adhering to the rules of form, guiding and arranging segments that divide the space, with a spiral staircase as its central core, providing light and air but also snug spaces. 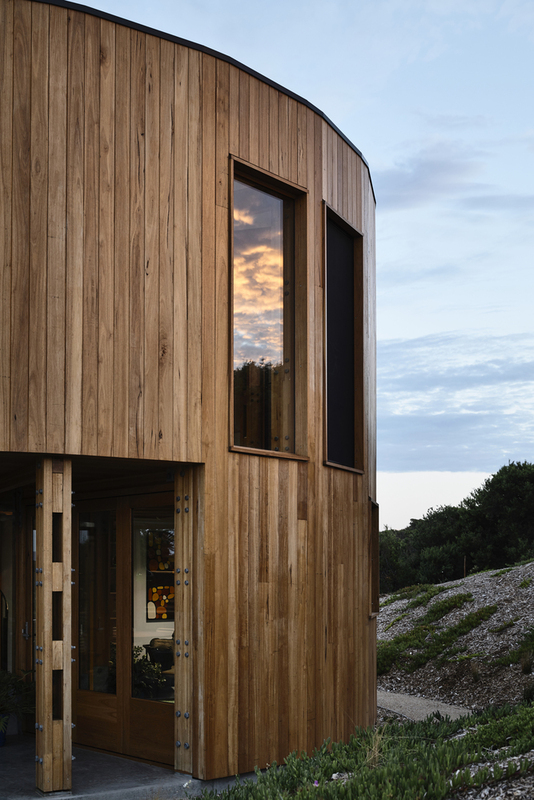 The house displays an innovative use of timber, with chunky details and exposed portal frames. 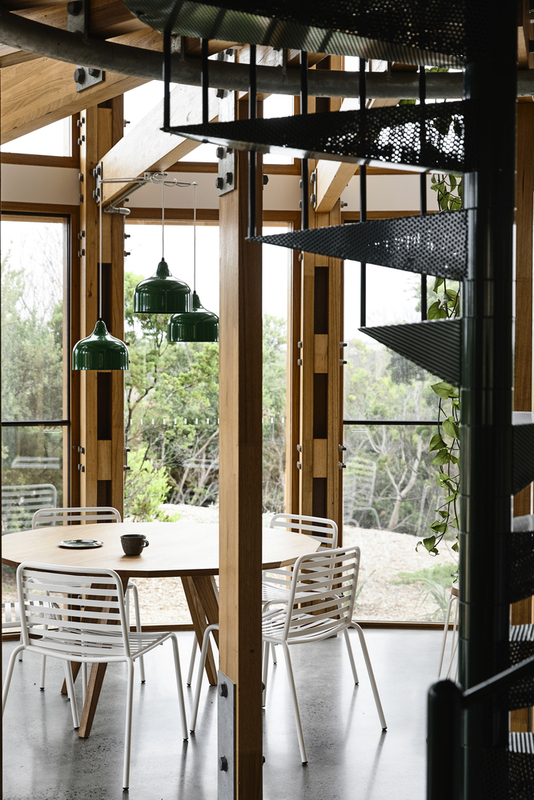 This is not a slick beach house, but a relaxed and informal escape, designed with materials that will patina and weather, like an old coastal wharf. The central spiral staircase leads upstairs to the bathroom and bedroom zone. 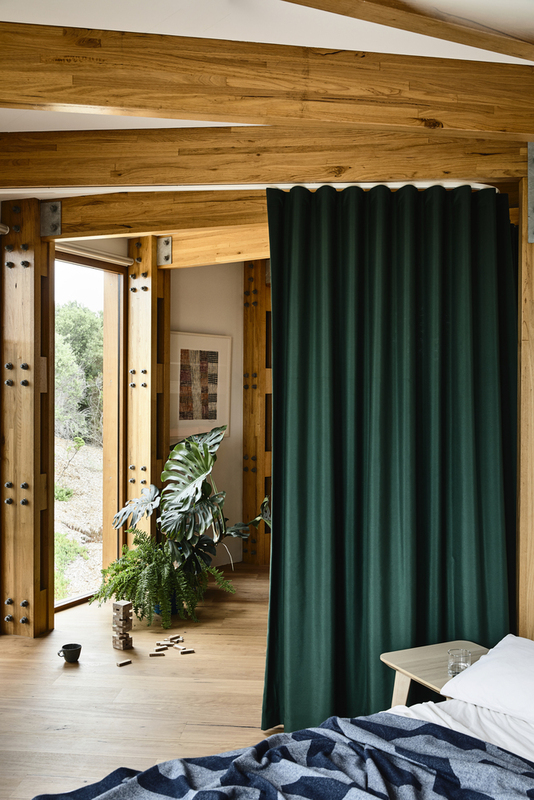 Unlike a traditional bedroom layout, the upstairs sleeping area is essentially one bunk room, separated by curtains. 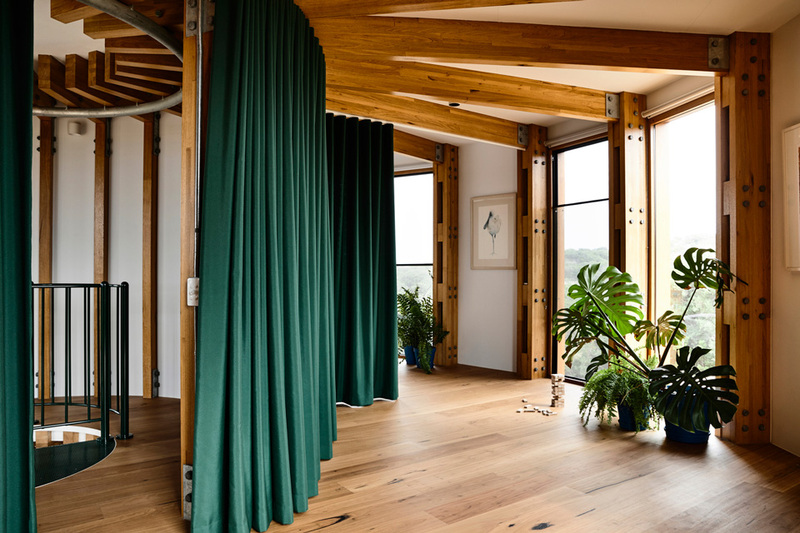 (space can also function as a second living or games room.) 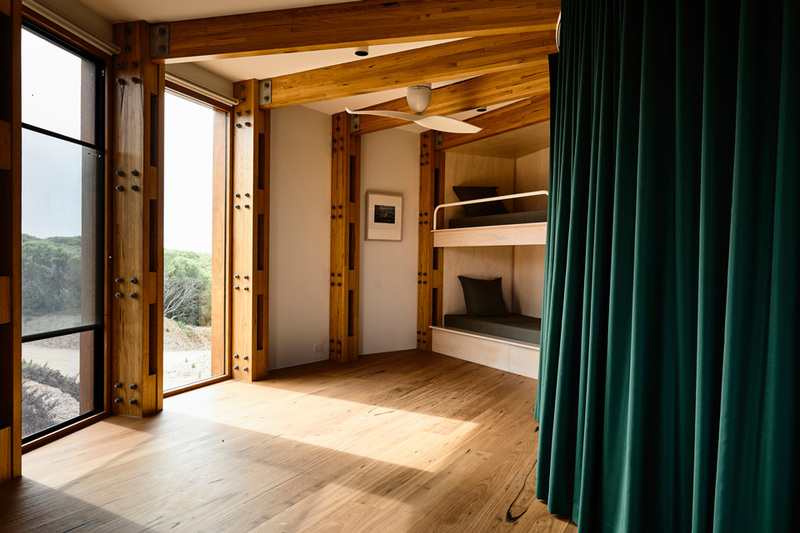 Rather than design, a series of sealed bedrooms, each with ensuite and walk-in-robe, the sleeping zone at St Andrews Beach House is informal, casual and relaxed. 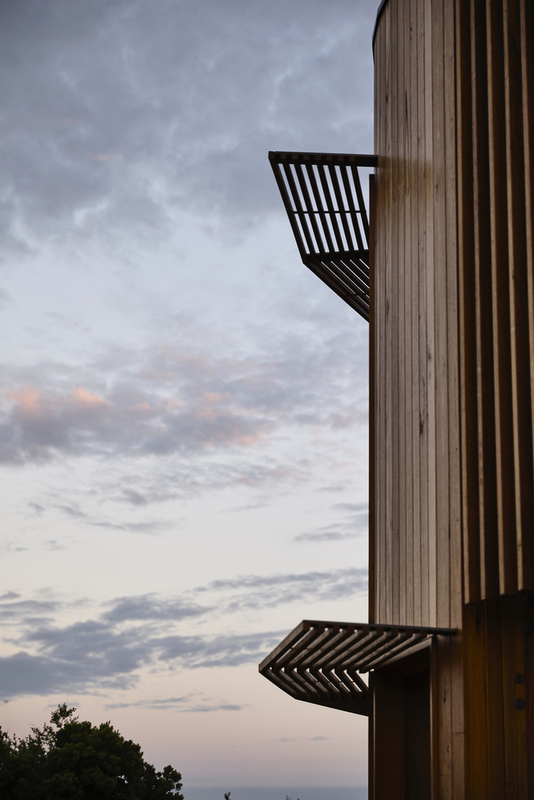 St Andrews Beach House stands at less than five meters in radius, creating a very small footprint amongst the dunes. 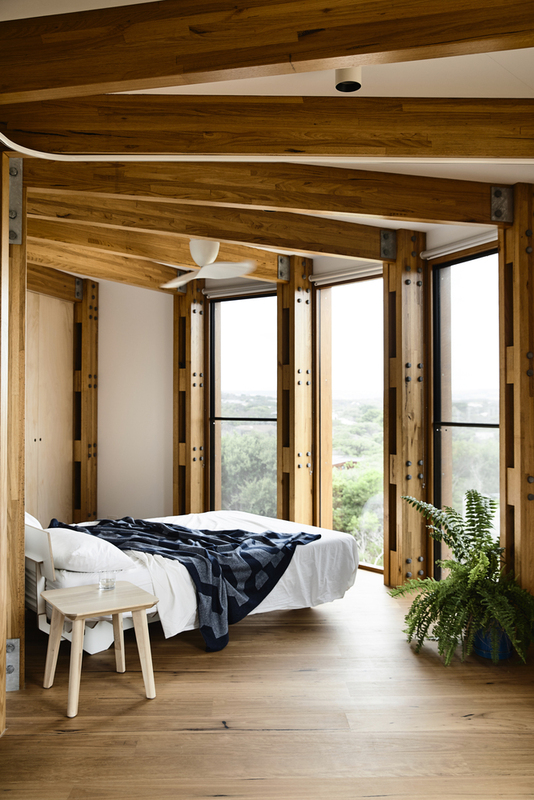 Like all of Austin Maynard Architects buildings, sustainability is at the core of this project. 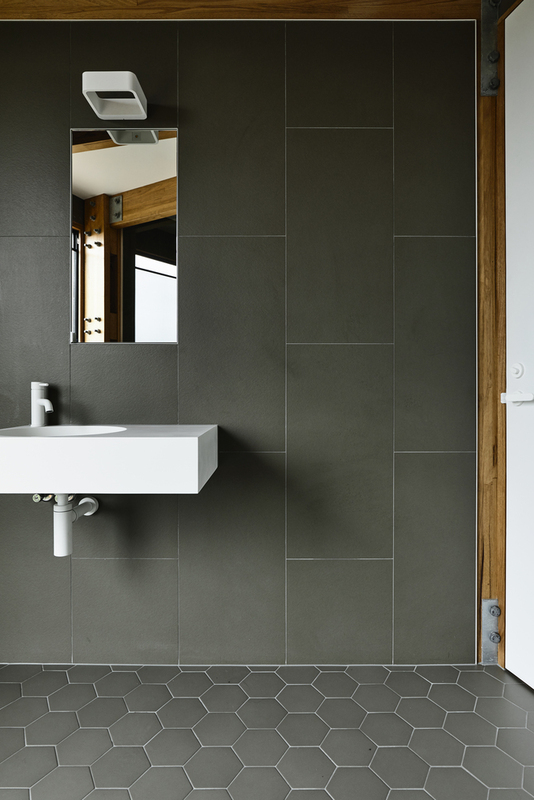 The materials used are robust and designed to weather.